When I found out that my adopted sailor would celebrate her birthday while deployed, I shipped a box or two of sprinkles and balloons. Sprinkle Sugar Cookies get the party started. Sending balloons required a bit of creative license. I couldn’t ship helium balloons by international air, so I opted for Balloon Sugar Cookies. They don’t float, but I think they still communicate happy thoughts and celebration. I made two batches of sugar cookies, one vanilla and one chocolate. Each batch made 12-14 (2 ½”) cookies. The recipe can be doubled. Corn syrup icing is easy to make and to use. No experience or skill is needed. This Balloon Sugar Cookie design is so easy, that kids could definitely help with the decorating. The cookies are covered in a background color. I used Americolor Sky Blue. After the background has time to set (one hour or longer) colored ovals are added. I used Americolor Super Red, Leaf Green, Violet, and Lemon Yellow. 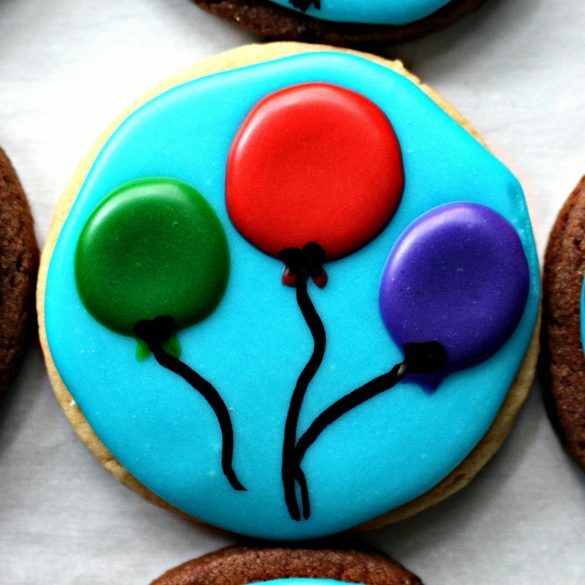 Immediately after adding the ovals to a cookie, I used a toothpick to gently pull a bit of the colored icing downward to create the balloon tips. After drying completely (at least overnight, possibly longer depending on humidity) balloon strings are drawn onto each balloon with a food marker. I recently purchased these Americolor Black Food Writers, and I love them. The dark black line glides onto the icing with no pressure at all. I’ve used other brands before, and the difference is huge. Usually, my military care package ideas fill up two Monday Box posts. This Birthday Care Package was special (as all birthdays should be) and it took three posts to share all of the contents. The Sprinkle Sugar Cookies are the new recipe included. The Birthday Party in a Box post gives directions and printables for shipping a box of 3-2-1 Microwave Mug Cake mix with frosting and candy add-ins. Balloon Sugar Cookies are the final celebratory treat. My care package also included a necklace, a small gift for Sailor A. You can find it on Amazon. 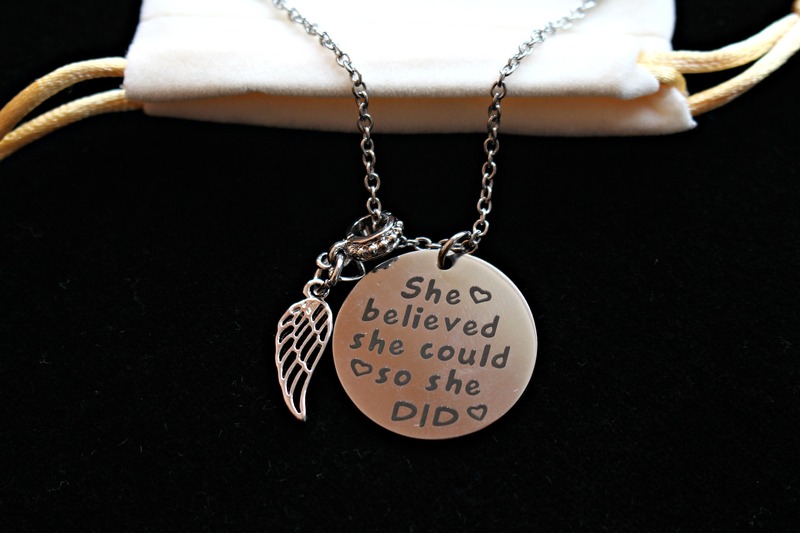 I think the message and attached angel wing charm is perfect. 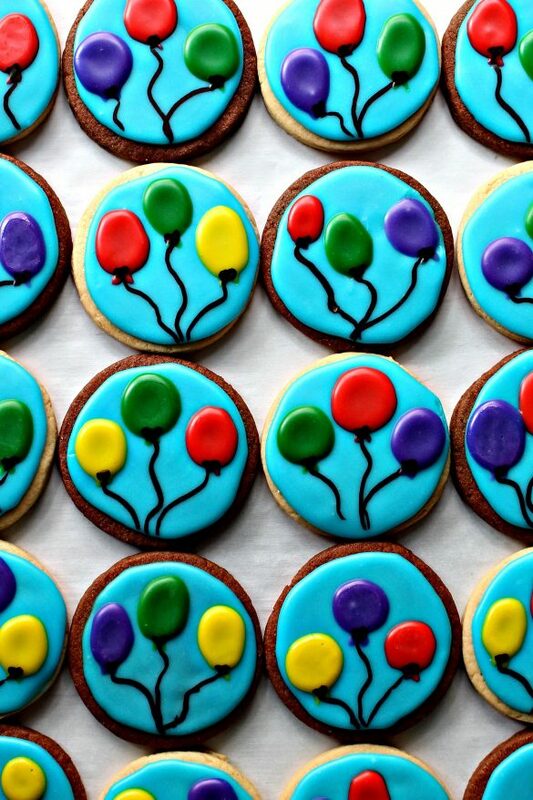 Turn any day into a special occasion with an easy to make batch of Balloon Sugar Cookies! Pre heat oven to 350 degrees F. Line a baking sheet with parchment paper. Gradually add flour. If making the cookies right away, use 2 1/4 cups of flour. If refrigerating dough for use in several hours or several days, use only 2 cups of flour. Between two sheets of wax paper or parchment roll out to slightly less than ½” thick ( about 3/8”). If the dough is sticky, dust lightly with flour. Cut out 2 ½’ circles. Transfer the circles to prepared baking sheet about 1” apart. Bake for 7-8 minutes. Remove from oven and cool completely on a wire rack before icing. Pre heat oven to 350˚F. Line a baking sheet with parchment paper. Mix in eggs and vanilla. Then mix in salt, baking powder and cocoa. Gradually add flour. If making the cookies right away, use 1 ¾ cups of flour. If refrigerating dough for use in several hours or several days, use only 1 ½ cups of flour. Cut out 2 ½” circles. Transfer to prepared baking sheet about 1” apart and bake for 7-8 minutes. 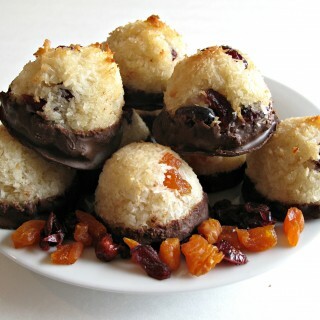 In the bowl of an electric mixer, combine the icing ingredients and mix until smooth. The icing should be the consistency of white glue. Add more milk in tiny increments if needed to thin the icing to the desired consistency. Spoon about 3 tablespoons of icing into each of four small bowls. For the balloon design, add one or two drops of food coloring to each small bowl and mix until the color is uniform. Add a 2-3 drops of Sky Blue food coloring to the remaining icing for the background color. 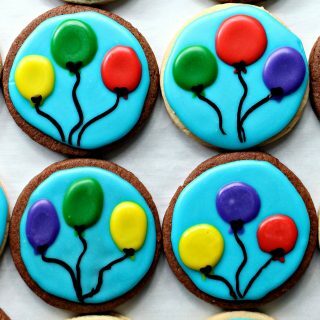 Spoon each color of icing into a separate piping bag fitted with a plain round piping tip (#5 for the background color and # 3 for the balloons). Pipe the background color onto each cookie, then allow to dry at least one hour. 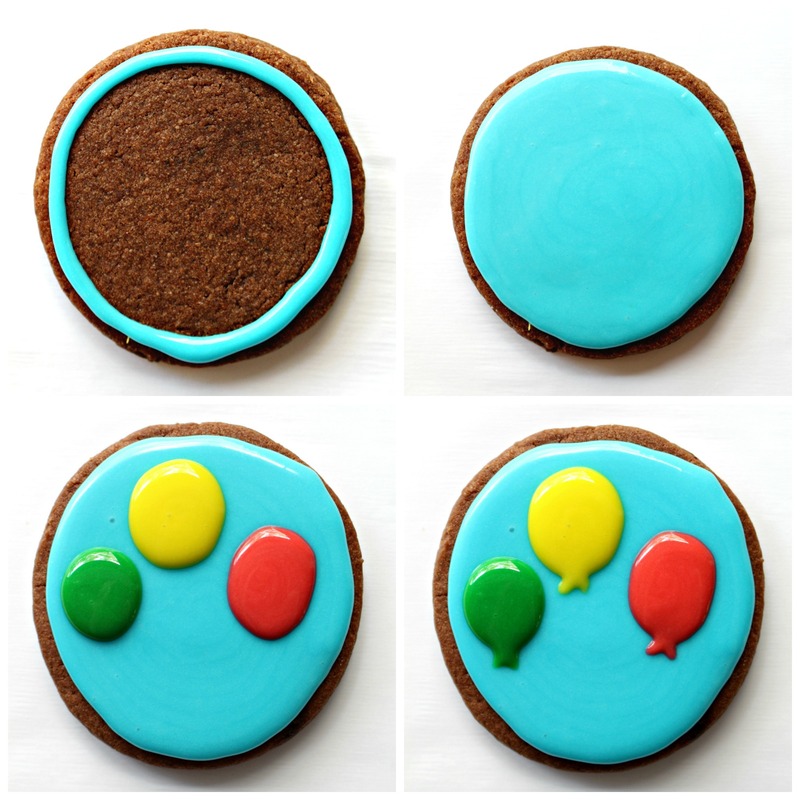 Working with one cookie at a time, pipe three balloon ovals onto the background. To create the balloon neck opening, use a toothpick to gently pull downward at the bottom of each oval. Let the cookies dry completely (overnight or longer) then use a food writer to draw on the balloon strings. Store in cellophane cookie bags or between wax paper, in an airtight container at room temperature for 2-3 weeks. Stack individually wrapped cookies (using cellophane cookie bags or plastic wrap) in an airtight container or freezer weight ziplock bag. Pad the box carefully to ensure no movement within the box during shipping. Wendy, your cookies just keep getting prettier and prettier. They always make me smile but these do in particular! 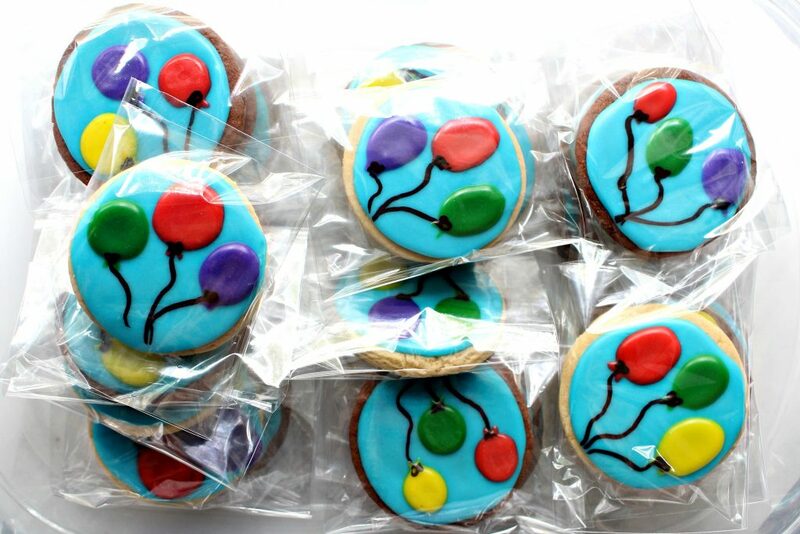 These cookies are adorable but I am obsessed with the idea of sending helium balloons to my kids in a box for their birthdays. Genius. Can’t wait to try it.